The front and hind legs are parallel. The tail is thin and long and contains a slight wave at the tip. The muzzle contains flews below the mouth. The tongue is not visible since the mouth is closed. Paper Size - 13X19 image is printed to edge of the paper. Print is an archival Giclee art PRINT. Good makes with good silversmiths included. See invoice if successful. Prepunched hanging hole. Colorful Image. Licensing is also a part of her new ventures and can be seen on products ranging from trays and trivets to music boxes. The towel is made from 100% absorbent cotton. Mary has created over 550 designs featuring more than 90 breeds of dogs, cats, ferrets, fish, birds and farm animals. Add personality and charm to your tree. Extra Large Great Dane Dog Bed Deluxe Orthopedic Big Pet XL Mat. Orthopedic foam base : Deep, convolute ('egg crate') foam core soothes pressure points and supports joints so your pet can enjoy a deeper, more restorative sleep. 2pcs #672 purple white cocker spaniel #817 brown great dane fake. Condition is Used. Shipped with USPS First Class Package. Vintage Great Dane Dog Figurine Statue Laying Porcelain Fawn 4.5" X 2"
I think it is Signed, I can't make out markings, Looks like a hand signature with tall cursive strokes. No Tail Slight Age related crackling on finish, Possible Factory flea bite glaze flaws. Perfect for gift giving. Great Dane. Made and screen printed in the USA. Approx 3 1/4"h x 3 1/4 " wide this cute magnet is great for holding a picture or piece or two of paper onto any magnetic surface. Nice item for dog lovers. Please see photos. Great condition. I combine shipping for multiple purchases. Please check out my other items for sale. THANKS! It is difficult to be perfect, occasionally a little. Also they have no magnet. ·Material: PVC. Made in China （not good for serious c.
Great Dane Pendant Necklace Silver Tone Lobster Claw Clasp and 18" Chain. Pendant is approx. A portion of the proceeds is donated to various Animal Rescue Organizations in PA.
A SPOILED ROTTEN GREAT DANE LIVES HERE! Has an easel back that opens to stand it on a shelf. Hang it or stand it. Proudly made in the USA. The Mountain Fawn Great Dane T-Shirt. 18" across chest from under the arms. 26" long from top of the shoulder to bottom of the front. The hind legs, upper back, ears and eyes have spots connected that form a large black mark. Harlequin spotting is absent on the neck and paws. You will also notice tan shading around the nose and mouth. 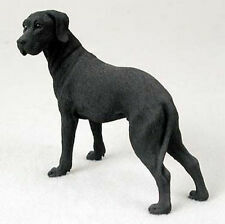 "Black Great Dane". This is an archival quality, open edition print of an original watercolor and is signed by artist DJ Rogers. Printed on heavy museum quality watercolor paper with archival inks and looks just like the original. New equal to Great Dane mower spindle pulley, narrow, splined Great Dane part # D18083. Great Dane. Blue Dot Eyes. Cream Brown. 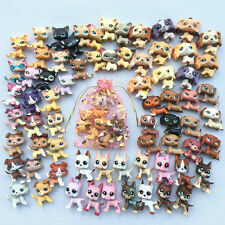 Q : How do I qualify for FREE GIFT DOG or CAT Pet?. A : Sorry, no special requests. Q : Do I get to choose a Free Pet?. Very good clean condition! I'LL BE BACK! wrightprincess63(73. ). "Great Dane Sunset". This is an archival quality open edition print of an original watercolor hand signed by artist DJ Rogers. His vibrant, realistic style is highly sought after and is actively collected worldwide. It is pre-owned, from a smoke free house, has been played nicely. Over all, It is in good condition in my opinion. Picture shown is an example of how the decal will look on a car window –ENLARGED to show the decals detail. adhesive decals. Default Color is: WHITE. These are vinyl. NOTE: Decals are set for outside surface application, but can be made, by request, for inside surface application (mirrored). 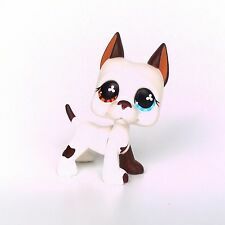 #750 White & Chocolate Brown Great Dane Littlest Pet Shop Dog Hasbro Authentic . Condition is Used. Shipped with USPS First Class Package. 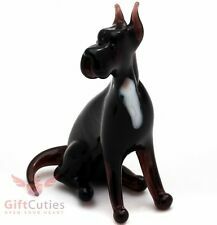 If you are a great dane lover YOU WILL LOVE THIS. IT CERTAINLY MAKES YOU SMILE. save us to your favorites so you don't loose out. We have had 6 Great Danes.once you love one-you have to have another! Condition:never been played. This will encourage us to get better and better! We believe that everything could be solved by good communication. You can check the goods staus in the follow websites. 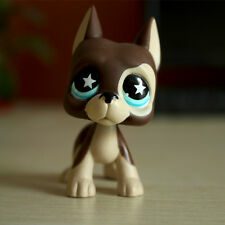 Q :How do I qualify for FREE GIFT Pet?. A :Sorry, no special requests. 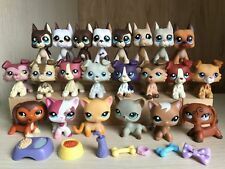 Q :Do I get to choose a Free Pet?. Function collectable toy. ★ A ll problems can be solved by proper communication and patience. Belt B/5L 21/32 x 153in OC. New ListingGreat Dane,- Beautifully Hand Engraved Ceramic Mug by Ingrid Jonsson. She is known for her anatomically correct dog engravings. Each piece she produces is an original work of art and signed. Excellent as trophy or fundraiser. Nice as gift. Great Dane, Harlequin with natural ears - Hand engraved and signed, original design, Ceramic Mug by award winning dog show artist Ingrid Jonsson. Stem Color = Clear. Eye Color: Blue w/ DOT shaped pupils. Fur Color: Tan & Brown.